The Chengdu Living Forum is online! I had to overcome quite a few obstacles to get this working, so I’m happy to release it. Basically, it’s a discussion forum with a classifieds section that’s built into Chengdu Living. 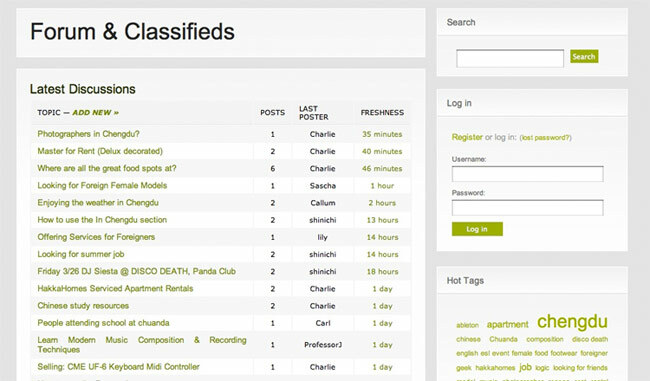 The Forum & Classifieds is broken into two categories (naturally) with sub-categories beneath. The Forum breaks out to General Discussion and In Chengdu, and the Classifieds lead to Marketplace (buy/sell), Jobs & Apartments, and Personals. I think this is a logical system that pleases almost everyone at once. There’s a temptation to create additional categories (like Food/Cooking or Travel), but that would be spreading the trickle of posts too thinly. With the traffic roughly divided between Eastern & Western hemispheres, there’s a need for general and local sections. Unfortunately there isn’t really a forum platform that can do everything that I want it to, because I wanted the forum to be within the site from the beginning (which vBulletin doesn’t like). bbPress is what I ended up using because it couples well with WordPress, but development is all but a lost cause. Many plugins don’t work or haven’t been updated in years, and the platform itself is really showing its age. It requires a LOT of customization and attention to clean up the small details. Some very small bugs remain, but I’ve achieved the goal of building it within the framework of Chengdu Living and will continue to develop it. As I’m sure you can imagine, I’m not the first to think of a location-based online forum & classifieds for Chengdu. Craigslist has a Chengdu section, but it’s almost totally empty. And then there’s GoChengdoo, which is a middle of the road option. I thought it was run by people I know, but I think someone in another city is actually pulling the strings. In the case of GoChengdoo, they have a good magazine which has come a long way, but their web offering is lackluster. I wouldn’t have made this forum if I didn’t think I could significantly improve on the options presently available. Stop it from stagnating. Make sure that there are always new users, always new topics, always new threads. Built it into something that people will want to use. Promote it. My hope is that people who read the articles on Chengdu Living check out the forum and participate. Interacting with readers and peers through comments on the site is fun and I hope to elevate that interaction to the next level with the forum.